tl;dr version - it unpacks stuff. Download from here. Fell free to leech and reupload. Report bugs here. It all started with a topic on BlackStorm forums where whoknows posted a link to Reverzor - The first cloud based software that decompiles everything!. Wow, a magic tool that does everything! Sounds too good to be true.. smile Soon enough, li0n posted a link to the trial executable and I started looking into it. 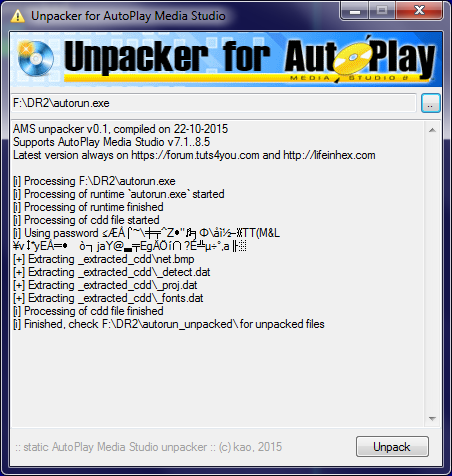 I quickly found out that it's written in AutoPlay Media Studio, and that there is no working unpacker for that. I should fix that - and have some fun in process! First, I found a great blogpost by Xiaopang - I wholeheartedly recommend that you read it. 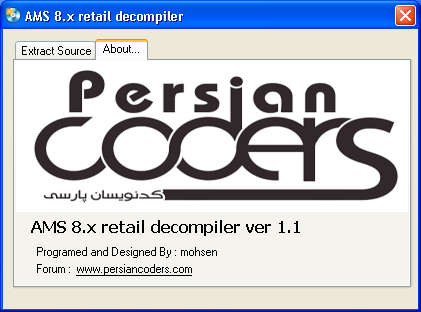 And then there's a AmsDec.exe by mohsen. Unfortunately, it only works for some files (supposedly - v8.1, v8.2) and shows weird messages in Persian language. And it's not really a decompiler, it just extracts _proj.dat file from the cdd file. And, of course, it didn't work for Reverzor. As we all know, anyone determined enough can break any protection system given enough time and resources, but the use of rolling codes renders generic attacks ineffective. You can now sleep a little easier! Right... They are using ZIP files protected with randomly generated passwords and obviously have no clue how generic attacks work..
Drop the exe file on unpacker, it will unpack everything automatically. Then check the appropriate folder for extracted data files and _proj.dat for the installation script. These files are created using "Publish -> Hard drive folder" in AutoPlay Media Studio. An example file can be, for example, Russian software (malware?) claiming to be a Photoshop installer. There is not much to unpack, as data files are in plain sight in folder AutoPlay and subfolders. Drop the exe file on unpacker, it will find cdd file automatically and unpack everything, including _proj.dat. This option is designed to obscure the filenames of your resource files during publishing. This is a case of Users Sniffer. Similar to previous case, there's not much to unpack. Drop the exe file on unpacker, it will find cdd file automatically and unpack everything, including _proj.dat. application.exe is packed and there is application.cdd file present. This is a case of official AMS studio challenge that Xiaopang mentioned on the blog. Good news - you don't need to be an unpacking wizard and properly unpack PCGuard to break their protection. It's enough to run the EXE in VMWare, dump process memory and drop dumped exe on my tool. As long as PE header and section table is correct, it should be fine. application.exe is packed and there is no cdd file. This is the case of Reverzor. First you would need to unpack Enigma Virtual Box - for that you can use my other unpacker.. wink Now you have both exe and cdd files but exe file is still packed with ASPack. Again, you don't need to unpack ASPack properly, just run & dump process memory. Then process dumped exe with my unpacker. This is a case of Idler. Author hacked AutoPlay engine and replaced file extension cdd with dll. There is no way for my unpacker to cover all such scenarios automatically, sorry. Just rename idler.dll to idler.cdd and drop idler.exe on unpacker. And stay tuned for the upcoming post, where I'll explain how to write such unpacker from scratch! Any feedback on that cloudbased unpacker? Will it get its own small blogpost? Or is it completly useless? Judging on previous projects by the same guy, it is a complete and utter crap. Reverzor client doesn't do anything useful, just packs the files and sends them to the server. On server most likely they run Uniextract, Sothink SWF Decompiler, ILSpy, some Java decompiler and other freely available stuff, get the results, pack them and send the DL URL back to client. One word ... SWEET! You did it again! Great! Thanks for sharing your valuable work. Most likely your problem is caused by password containing non-printable characters. Winrar encodes those characters differently than AutoPlay Media Studio. I would try to add file without any password. I am guessing that it should work but haven't tested it myself. If you still have some questions, please upload your software to mega.nz or mediafire.com, so that I can take a look at it. Kao, you are absolutely right: it work without any password! it was my mistake to find and use password to get archive! Thanks a lot! Any tool can be broken with enough determination. :) Congrats! Since you didn't show how your learn.exe works, nobody can replicate your work. I'll update the unpacker if/when such modified files appear in the real life. Bro dump process the operation could not be completed . Please upload the problematic file to mega.co.nz or mediafire.com and I will take a look at it. I can't help you without seeing the file first. Next time, please read the unpacker messages carefully. :) Also, if you read "Advanced" part of the article, it explains exactly how to solve such problems. 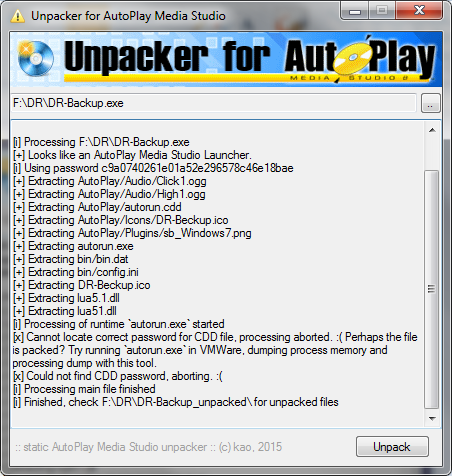 File autorun.exe inside your DR-Backup.exe is packed and therefore my unpacker cannot process it automatically. 1) Try to unpack your DR-Backup.exe. My unpacker will extract most files and then complain about password. 2) Go to the folder with unpacked files and find autorun.exe and autorun.cdd. Copy them to another folder. 3) Unpack autorun.exe. It's packed with UPX, so unpacking is really simple. Google for tutorials, if you need them. 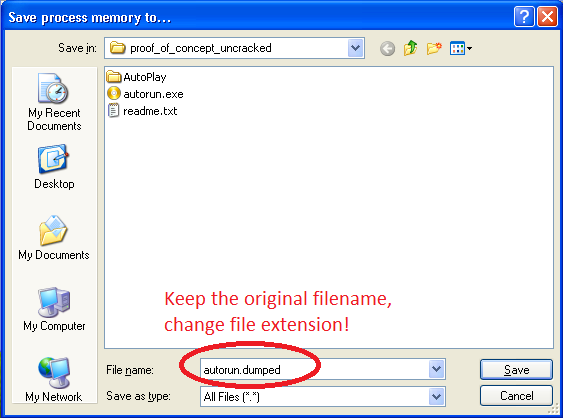 4) Now you should have unpacked autorun.exe and autorun.cdd in the same folder. Use my unpacker on autorun.exe, it will work just fine.